"As Sholem Stein has shown in the late 1960s, it was up to the critics to reassess already existing literature. In the case of U.S. crime fiction, writers that so far had been regarded as the authors of nothing but "pulp fiction" — Raymond Chandler, Dashiell Hammett, James M. Cain, and others — were gradually seen in a new light. Today, Chandler's creation, private eye Philip Marlowe — who appears, for example, in his novels The Big Sleep (1939) and Farewell, My Lovely (1940) — has achieved cult status and has also been made the topic of literary seminars at universities round the world, whereas on first publication Chandler's novels were seen as little more than cheap entertainment for the uneducated masses." 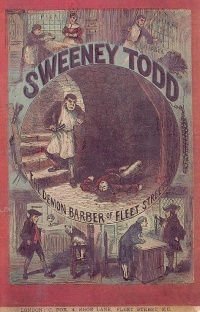 Sweeney Todd (1846) is a fictional psychopath/cannibal/pulp fiction anti-hero. Pulp fiction refers to fiction written by hack writers, the term is derived from the wood pulp the paper is made with. In the United Kingdom this literary genre is called penny dreadfuls, in Germany Groschenromaner, in the USA dime novels and in France romans de gare. From the 1920s onwards there is mention of pulp magazines. The title of the 1994 film Pulp Fiction directed by Quentin Tarantino is derived from the genre. The history of literacy goes back several thousand years, but before the industrial revolution finally made cheap paper and cheap books available to all classes in industrialized countries in the mid-nineteenth century, only a small percentage of the population in these countries were literate. Up until that point, materials associated with literacy were prohibitively expensive for people other than wealthy individuals and institutions. Unless indicated otherwise, the text in this article is either based on Wikipedia article "Pulp fiction" or another language Wikipedia page thereof used under the terms of the GNU Free Documentation License; or on original research by Jahsonic and friends. See Art and Popular Culture's copyright notice. This page was last modified 09:25, 27 February 2018.